The Waterhen Bloa is a famous pattern devised by T E Pritt in the early to mid 1800s. It is a standard wet fly in the fly boxes of river fishermen throughout the North of England and had been for the best part of 200 years. 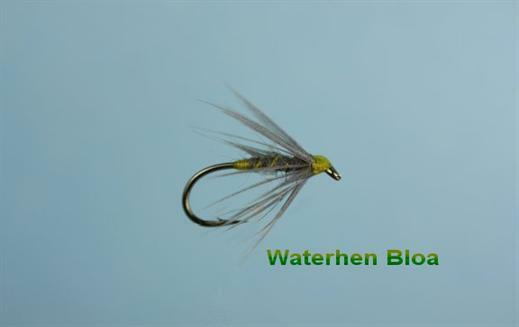 Although it was intended as a wet river pattern it has also proved successful on brooks and is a first class loch fly. For a point fly there is no dressing to equal Waterhen Bloa, wrote T C Kingsmill Moore in 1960. Waterhen is known today as a Moorhen. Thread : Yellow tying silk. Body : Dubbed grey water vole or mole's fur. Hackle : Inside of a water hen's wing, spoon shaped and glossy.